Including some drawing practice in training sessions can help trainees retain information better. In fact, drawing has been proven to be more effective than writing or other retention methods at boosting memory. One study in The Quarterly Journal of Experimental Psychology asked subjects to draw or write down different items. Overall, the subjects were better able to recall items which they drew. Unlike writing, drawing combines three distinct experiences linked in the mind: semantic (the translation of a word into drawable characteristics), motor (moving your hand to draw) and visual (watching your drawing take shape). Remembering one small detail helped them recall all of what they studied. Creating art strengthens the connection between the left and right hemispheres of the brain and stimulates the growth of new neurons. These neurons make it easier to concentrate, focus, and make the brain more receptive to new information. Creating art even boosts psychological and emotional resilience and resilience to stress — which will help your learners stay mentally calm when they’re at work. After creating art, your learners will have a clear and stress-free mind which will boost their concentration and productivity. Art gives the brain a break from analytical, linear thinking and lets creativity flourish. Incorporating art into work training helps trainees engage their creative side, so they can better come up with unique solutions to problems. In art, there’s never just one correct answer. It encourages out-of-the-box thinking (which grows new neurons) and strengthens problem-solving skills. Your learners will therefore be better able to brainstorm ideas and solutions whether they’re working alone or within a team on a project. Ultimately, the mental benefits art provides will result in better success for your learners and your company. 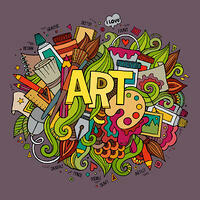 Art activities will also create a more enjoyable training experience. Let your learners know there’s no need to feel intimidated or under pressure since it’s the process of creating art that’s important — not the final results.